Ever since Emma was a baby she has loved to eat chocolate. Chocolate candy bars and chocolate ice cream, chocolate chip cookies and chocolate cake with chocolate frosting. She not only is known to eat chocolate on a daily basis, but also is known to wear it. She has a special talent for getting chocolate on her face and clothes and, on at least one occasion, she managed to somehow get chocolate on the BACK of her shirt! While we were in Florida we stopped by the shops in Downtown Disney because Ethan and Drew wanted to go to the Lego Store. 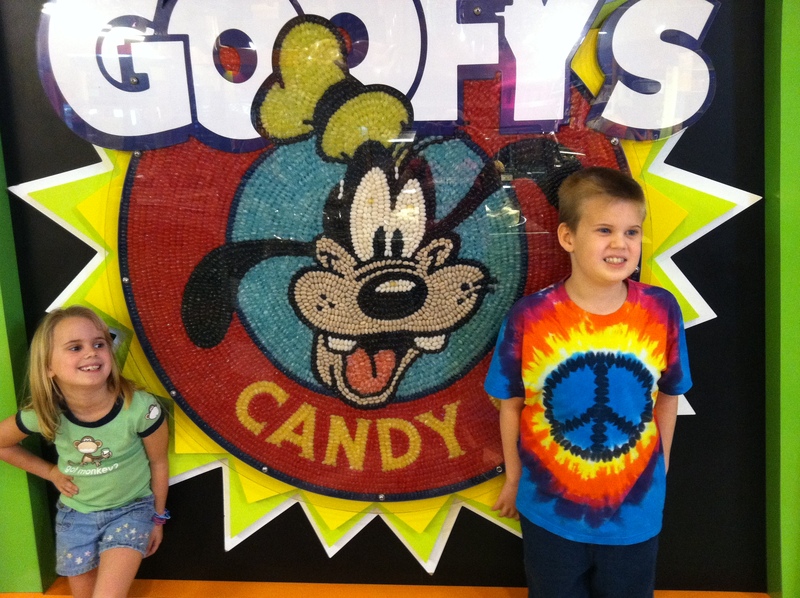 On our way to the Lego Store Emma and Caleb were distracted by the Goofy Candy Store … Emma because she saw the word “candy” and Caleb because Goofy is one of his favorite Disney characters. They both really wanted to stop so I sent Dwight on with Drew and Ethan to the Lego Store and Emma, Caleb and I went into the candy store. I have to admit I was much more excited by the candy store than the Lego store … I’m all about the candy and chocolate too! Talk about being a kid in a candy store … Wow! There was wall-to-wall candy, cookies, cakes, and anything else sweet you could possibly want. 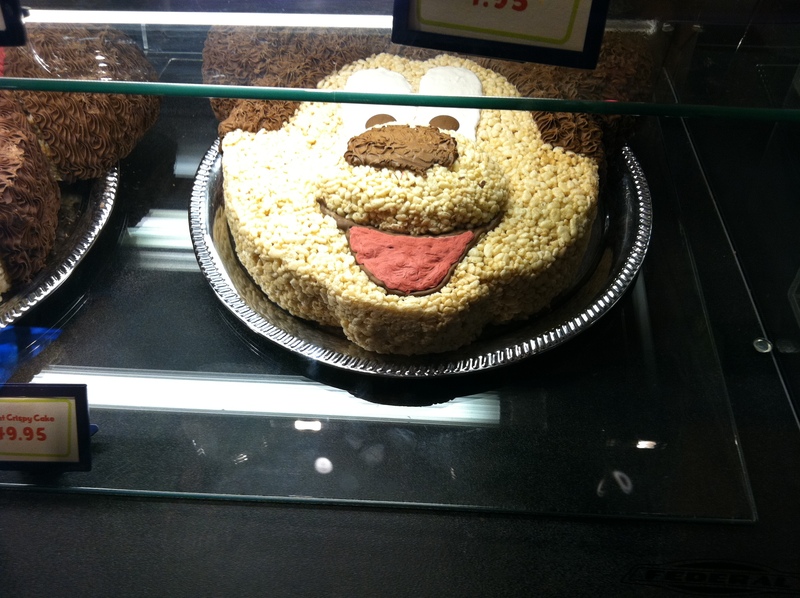 They even had a giant Rice Krispie Treat shaped like Mickey Mouse that looked like a cake. The bakery was right in the center of the store so you could see and smell all the delicious treats throughout the store. Emma went over to the bulk candy bins and found what looked like gummy bears, but instead of being shaped like bears they were shaped like Mickey Mouse. Mickey Mouse Gummies?? How could we not buy some? Emma put a few scoops in a baggie and then also suggested we buy some M& M’s too since they are Emma & Ethan’s favorite. The cashier rang up the candy and said, “Your total comes to $9.78” “I could have bought the same amount of M&M’s and gummies at Wal-Mart for about $2.00!” I thought. I glanced back at that the sign above the bulk bins and saw that It said “Bulk Candy ~ $12.00/lb”. After handing the cashier my debit card and paying for our candy, Emma and Caleb followed me out of the store. As I looked back at Emma who was skipping happily out of the store with the two bags of candy in her hand and a smile ear to ear on her face, I knew it was worth the extra $7.78 !